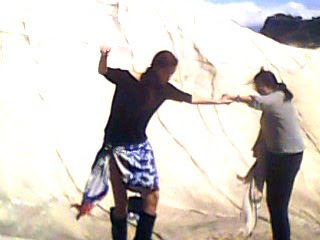 Here's one of the four editorials I did in Ilocos with Louis Vuitton's Resort 2010 collection. It was extremely hot and windy, three hours of shooting felt like eight! It was so windy during the first few layouts that the models couldn't even stand for more than a few seconds without falling. Nevertheless, I was really happy with the results :) I hafto say, dirtying up designer goods was priceless! Oh'! this concept is kinda like the Spring Collection of Baby Phat. They did also shot on the rocks, except the background beach. Try to search it, so similar to it. anonymous: i haven't seen that before. shoots look similar all the time. lots of shoots have been done around rock formations. can i just say that i wouldn't even consider using baby phat as reference. eek. haha BJ! your Baby Phat comment... LOL but soo true, that wasn't even a considered peg! Congrats! youre a fantastic photog!! congrats Beeej!! these photos are super amazing!! haaaaaa! ZIGGY SAVELLA Holiday 2010 Invites!